One of the main questions of our research, is how does the neural code fundamentally alter how we interact with our world and how does our behavior “close the loop” to alter our neural code? When in any environment, we are not passive sensors, but active participates, where we touch, look, and attend to our surroundings. Through these active processes, our nervous systems become dynamic systems which can detect and discriminate objects on rapid timescales. Through our research in the rodent whisker system, we have begun to explore how bottom up mechanisms such as sensory adaptation, and top-down mediated, brain states, alter how we perceive and behave in our world. When we interact with a novel object, our first instinct is to explore the contours and to feel the texture through active sensing. At first we are able to just detect the object, however given repeated stimulation, our sensory system begins to adapt to the stimulus, and we begin to discriminate additional characteristics. This phenomena known as sensory adaptation, leads to an overall decrease in neural activity which fundamentally changes the neural coding properties and serves to improve information transmission of complex inputs. This dichotomy has been heavily examined in our anesthetized work. 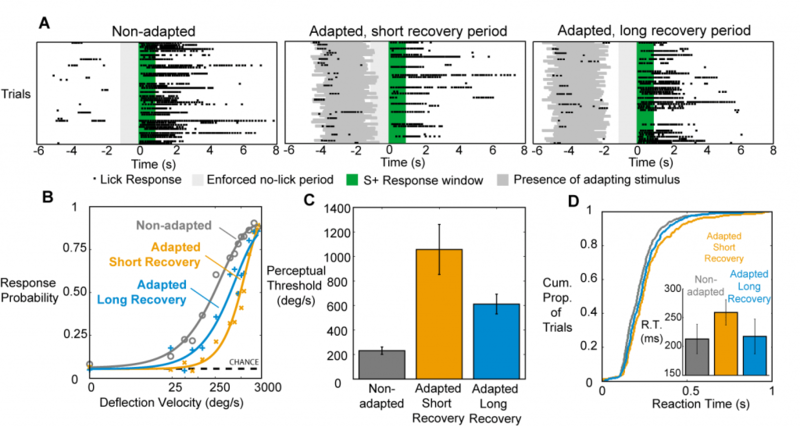 Through a number of studies in our lab (and others) using both anesthetized and awake animals, we have shown that the neural code fundamentally changes with sensory adaptation, and more importantly change the behavior of trained animals. 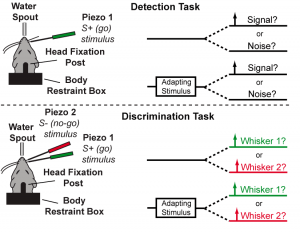 Rodents are that can be trained to respond to sensory stimulation of the whisker system, which we have used to validate theories and phenomena shown in anesthetized data sets. In particular, rodents can be trained to detect a whisker deflection, and respond by licking a water spout. 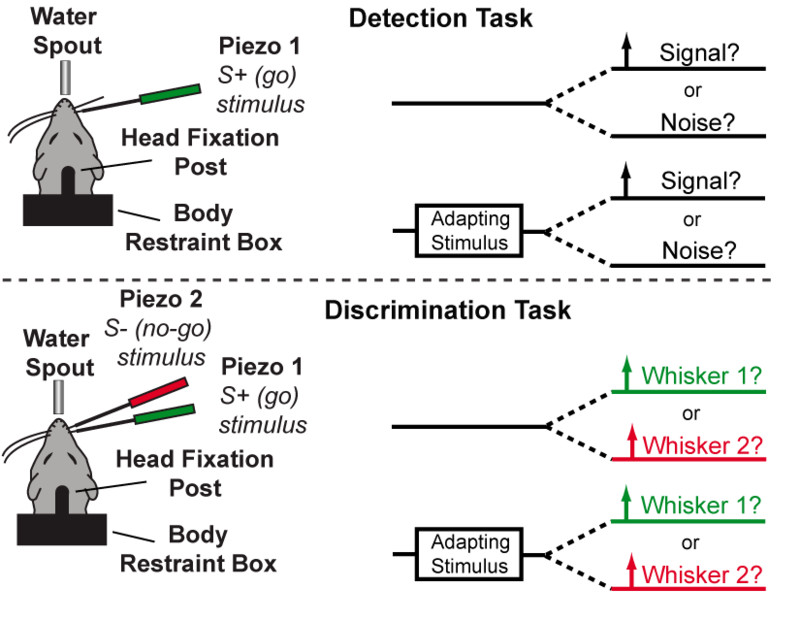 detect sensory stimulation while increasing the discriminability of different stimuli (Ollerenshaw et al 2014). 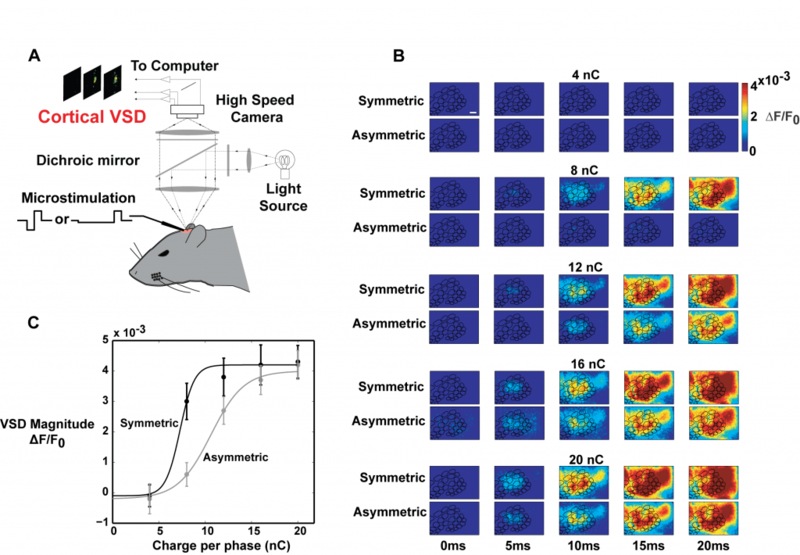 Through simultaneous recordings in the thalamus, we have shown that primary sensory thalamic region appears to play a vital role in awake animals in controlling the transmission and neural encoding of sensory information to downstream cortical regions. In particular, the thalamus appears to regulate sensory information by controlling a synchrony code, which can dramatically shift the nonlinearities in the encoding of sensory stimuli. Electrical microstimulation has been widely used to artificially activate neural circuits on fast time scales. 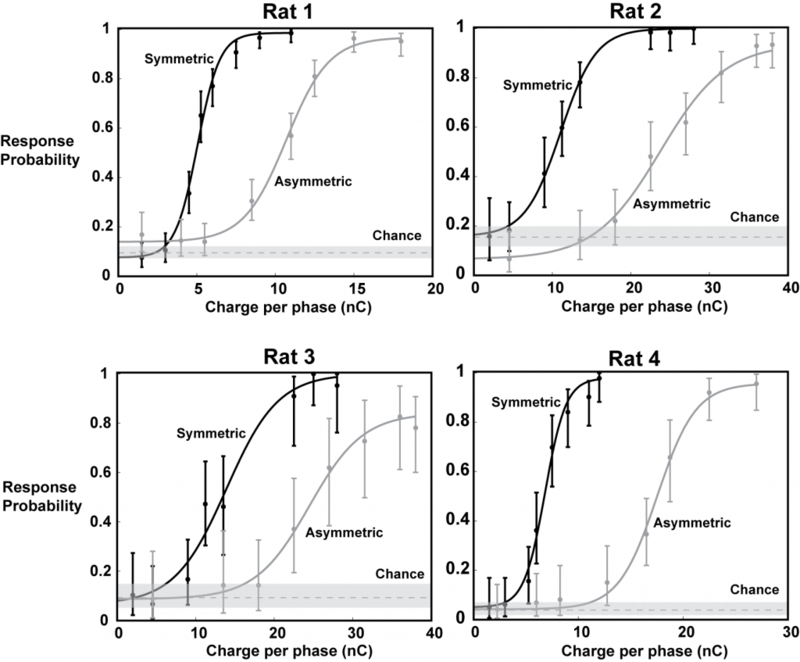 resulting in negligible net charge delivery to avoid the neurotoxic effects of charge accumulation. Altering waveform shape and using an asymmetric current pulse waveform theoretically reverses this bias and preferentially activates cell bodies, providing increased specificity. We compared the behavioral and electrophysiological effects of symmetric vs. asymmetric current waveform shape in cortical microstimulation. amplitudes. Using voltage-sensitive dye imaging of cortex in anesthetized animals with simultaneous cortical microstimulation, we found that altering microstimulation waveform shape shifted the cortical activation in a manner that mirrored the behavioral results. Taken together, these results are consistent with the hypothesis that asymmetric stimulation preferentially activates cell bodies, albeit at a higher threshold, as compared to symmetric stimulation. Bari BA, Ollerenshaw DR, Millard DC, Wang Q, Stanley GB. Behavioral and electrophysiological effects of cortical microstimulation parameters. PLoS One 8: e82170, 2013.